How does the Bates LTPI™ work? The LTPI™ measures team behaviors – on a Likert Scale (1-5) – providing feedback to the team on 90 items within 15 facets. With this feedback, the team is able to see if their actions help or hinder performance. The assessment looks at a team as a unit that exists for a common purpose and must coordinate to accomplish its goals. The assessment is designed for all types of teams – executive leadership, business or function, cross-functional, project, M&A, and teams formed to accomplish a specific initiative. The team looks at itself, as a group, through the lens of a multi-rater survey (360) where each team member evaluates the team “as a whole” on 90 items and 3 open-ended questions. The team, and its members can choose to only evaluate themselves, or they can expand the view, by inviting outside stakeholders to participate in their evaluation. Examples include – a board, executive group, teams they work with, senior executives, customers, or others – that are able to “look in” and evaluate them, as well. 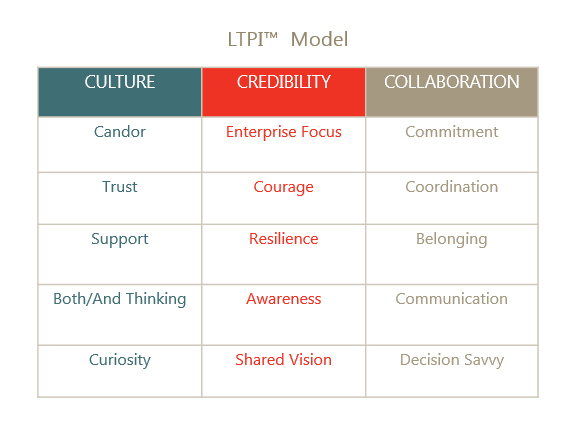 The LTPI™ report is interpreted together in a facilitated setting that encourages open discussion and exploration. Members of the team are encouraged to tap their collective wisdom to discover how they want to take the performance to the next level. "Team members are appropriately open about their emotions when discussing issues." "The team accesses outside resources to help the team make better decisions." "The team explores contrary views before arriving at a resolution everyone supports." "The team regularly looks ahead and takes into account the future good of the enterprise." "Team members ask probing questions to bring out creative tensions that generate innovative ideas and approaches." "The team is attuned to the changing wants and needs of key stakeholders." "Team members leave meetings with agreements on accountability and responsibility." "On this team, members are accepted and valued for who they are as individuals." "The team always spends time defining the problem before moving to solutions."